After 2011 and 2013 the German Biathlon stars of the international Biathlon scene will fight for the German Champion title again in September 2015 at the Ski intensive training center / Hohenzollern Ski Stadium at the Great Arber Lake. After the official training on Friday the fights for the title in spring on Saturday and in the pursuit on Sunday are in the focus. After the Championships for the title of the International Biathlon Union had to be canceled because of the warm weather and the corresponding lack of snow, the presenters of Biathlon – organization committee Langdorf with Otto Probst and the head of the competition Sepp Schneider are looking forward to the fights for the title. With the sprint on Saturday and the following pursuit on Sunday two very attractive competitions can take place in the Bavarian Forest. Sepp Schneider emphasizes the importance of the German Championships: “Besides the fight for the title German Champion these competitions serve also as an orientation over the actual state of training of the athletes and the coaches!” He is especially happy about the high level of performance of the competitions, because: “If you are at the front of the German biathlon cadre you are also part of the world’s best!” he emphasizes. A look back to the last World Cup seasons shows that: with Simon Schempp (4th place) and Erik Lesser (9th place) two German Biathletes could place themselves at the world’s best in the men’s competitions. In the women’s competitions even three women could: Franziska Hildebrand (5th place), Laura Dahlmeier (8th place) and Franziska Preuß (9th place). Also at the World Championships the German Biathletes showed an outstanding performance. 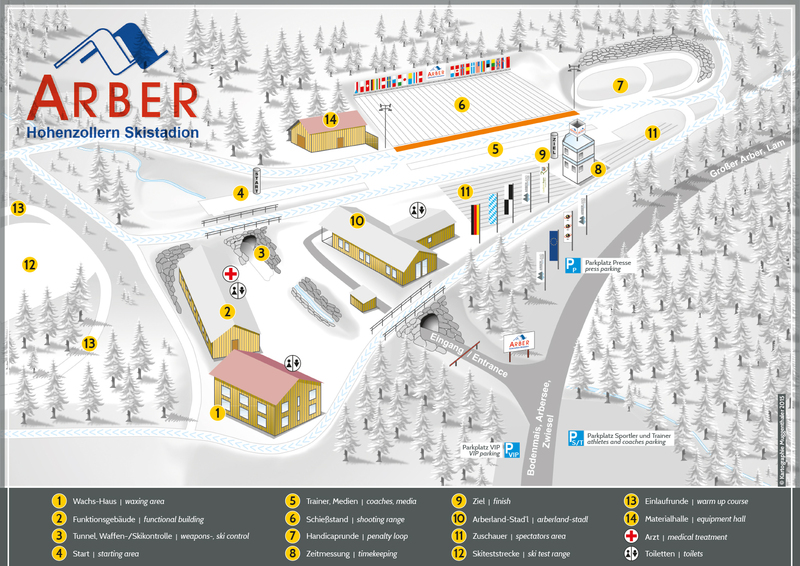 Overall eight current World Champions (Erik Lesser in the pursuit and together with Daniel Böhm, Arnd Peiffer and Simon Schempp in the relay) as well as the Women’s relay with Franziska Hildebrand, Franziska Preuß, Vanessa Hinz and Laura Dahlmeier will start at the Hohenzollern Ski Stadium. It will be also very interesting to see how Miriam Gössner and Andreas Birnbacher can establish themselves back at the German’s best after their health problems in the last season. For sure the local hero Florian Graf will be in the center of interests. In the last season he was the overall winner in the sprint competitions and of the overall standing in the IBU Cup. He will do his best to apply for the World Cup next season and to defend the German Champion title in the sprint that he won 2013 at the Hohenzollern Ski Stadium. But also the stars of the international biathlon scene of tomorrow, the hopeful young blood of the biathlon national associations will present themselves at the German Championships and try to surprise their idols. Sepp Schneider promises not only exciting competitions on a world class level but also that the spectators will get that close to the biathlon stars like in no other biathlon stadium like the Hohenzollern Ski Stadium. The persons in charge around Otto Probst and Sepp Schneider hope to get as many spectators as possible: “ To cheer at all athletes and to create unforgettable German Championships for actives, coaches and staff at the Bavarian Forest. The booster club of the regional intensive training center Arber starts the mammoth task of the extension of the Hohenzollern Ski Stadium at the Great Arber Lake with an almost unchanged committee. The team around Hermann Kastl, who was confirmed as the head of the committee at the general assembly, has to do loads of works in the upcoming year. They want to accomplish the modernization of the facility this year so that the competitions of the winter season ate possible in the stadium. Hermann Kastl restricts to inform the visitors about the upcoming extension in his report at the Hohenzollern Stadium. The activity is assessed to 2, 8 million Euros and this sum can be hold according to Kastl’s opinion. “It was not easy to gain a bearable compromise for the agreed individual projects for all people concerned”, said the head of the committee. After a hard work with consideration of various planning and changing wishes they had step by step reached the state that can now be transferred. Kastl thanked especially the planer Karl Kindl, who realized the laid wishes. The booster club can hope for financial help from the Leaderproject, from the BSV promotion of excellence and a special promotion of the ministry of education. In the upcoming winter competitions will take place at the Hohenzollern Stadium. The extension plans are oriented on this. At the beginning of June the first drafts should be assigned. The advertisements for further operations are running the groundbreaking ceremony is planned for the 13th June. “Our ambitious aim is to complete the extension this year after we have already appealed to nationwide competition in 2015”, said the head of the committee. In the alignment for the drinking water supply the waste pipe will be laid, informed Karl Kiendl. In addition empty tubes for a later extensive electrification and artificial snowmaking are planned. The fire water supply is made sure over a cistern. With an extensive extension at the roller ski track they found a better solution instead of the restoration of the damaged spots. Because of the lacking side strips accompanied to the roller ski track an almost 1,50 meter broad cross running area will be made. In addition to that the shortfall will be bituminized to fulfill the competition demands. At the electronic allotment a small solution is preferred according to the planner. In the area of the shooting stand 18 meters high poles should fulfill the full strengths of illumination. In addition to that the laying of glass fiber cables is planned to improve the evaluation of the competitions. The building for the athletes will be built where now the waxing cabins are and will be a combination of the existing and new containers. In this building will be for example rest and training rooms as well as sanitary facilities. The shooting range will adhere to the highest state of technique after the restoration. “The skids will fall and will be replaced new skids through an impulse”, said Karl Kiendl. This means for the coaches that they get the dispersion patterns of the athletes immediately on their laptop for evaluation. “The winter was not a winter”, was the sober conclusion of Sepp Schneider concerning the Biathlon season. Many competitions had to be cancelled among them the Conti-Cup. 80 athletes are currently training in the Biathlon Stadium that is on the third rank after Ruhpolding and Oberhof. “Seven of them are among German’s best”, added the head of the head of the base. For 10th January 2015 the Alps Cup is planned, one week later already the IBU Cup. According to that they have applied for the roller ski World Championships, said Schneider. “We had always good competitions”, said alpine head of coaches Karl Köppl. He praised the cooperation with the Arber-Bergbahn. With the students the trainer can look back at many national titles of his athletes among them three could change to the elite school of sports in Berchtesgaden. From the cashier report of Paul Wölfl you could see that the maintenance of the ski stadium brings a lot of effort with it. “In the alpine sector the Arber-Bergbahn takes over the biggest part”, said the cashier, who is in duty for many years. The cashier controller Hans Plötz and Hans Weininger attest Wölfl a perfect work and the general committee was unanimous confirmed. The maintenance of the stadium is in the hand of the charitable Arberland Regio GmbH, as head of business Herbert Unnasch explained, “the maintenance will rise with the reconstruction” and announced that the marketing has to be more professional for this reason to gain more profit. With an acclamation under the management of Herbert Unnasch and Tobias Wittenzellner the head of the booster clubs were occupied for the next three years. Elected were: 1st president: Hermann Kastl, Lindberg; representative presidents: District Administrator Michael Adam (Regen), District Administrator Franz Löffler (Cham), Mayor Charly Bauer (Bayerisch Eisenstein) and Thomas Liebl (Head of Arber-Bergbahn, princely administration of Hohenzollern); director and cashier: Paul Wölfl (Zwieselerwaldhaus). Club committee: Head of base Biathlon/ Cross country skiing: Sepp Schneider, Regen; Head of base alpine: Gerhard Richter, Bad Kötzting; local agents Upper Palatinate: Karl-Heinz Sölch, Cham; administrative district agent Cham: Markus Müller, Neukirchen b.hl. Blut, municipal agents Upper Palatinate: Paul Rossberger, Mayor of Lam; Markus Hofmann, Mayor of Bad Kötzting; Franz Müller, Mayor of Lohberg and Josef Schmid, Mayor of Arrach. Municipal agents: Ilse Oswald, Mayor of Regen; Franz Xaver Steininger, Mayor of Zwiesel; Joachim Haller, Mayor of Bodenmais and Otto Probst, Mayor of Lam. Also in the club committee are: Michael Torger, commander of the armored infantrymen bataillons 112, Regen and commander of the federal police Deggendorf. Club representative Upper Palatinate: Sepp Klingseisen, SpVgg Lam; Club representative Lower Bavaria: Alfons Piermeier, TSV Regen; School representative Upper Palatinate: Josef Baumann, Arrach-Haibühl; School representative Lower Bavaria: Reiner Gattermann, Realschule Zwiesel; Representatives private members: Martin Adam, Zwieselerwaldhaus; Gerhard Aschenbrenner, Arrach; Cash auditor: Heinz Felgenhauer, BLSV- head of district Hans Plötz, Viechtach.